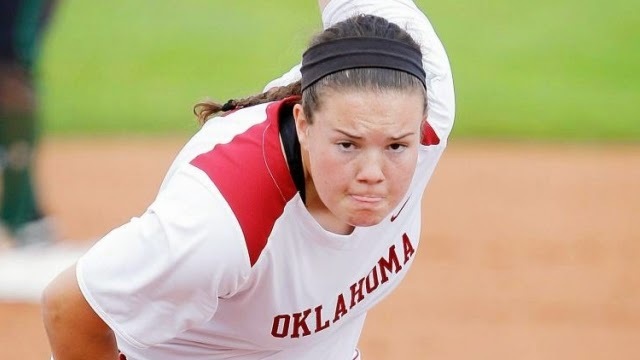 For the fourth time in the last five seasons the Oklahoma softball team has at least three representatives on the NFCA All-American teams, released Wednesday by the National Fastpitch Coaches Association. Sophomore Paige Parker was named to the All-America First Team, while senior Erin Miller and freshman Shay Knighten were each selected to the All-America Second Team. OU was one of nine teams to have at least three All-Americans, and it’s the sixth consecutive season that OU has had at least one member on the first team. Parker is a two-time All-American now after being named to the second team a year ago. She becomes the 14th Sooner to earn multiple All-America honors, but just the fourth to receive the recognition as both a freshman and sophomore. The only other Sooners to do that were Jessica Shults, Keilani Ricketts and Lauren Chamberlain. The Big 12 Pitcher of the Year and a First Team All-Region Selection, Parker is 33-3 on the season with a 1.55 earned run average and 244 strikeouts to just 57 walks in 216.1 innings pitched this year. She leads the nation in wins and ranks second in shutouts with 13. She’s also 15th in strikeouts and 18th in ERA and hits per seven innings (4.56). She’s had four stretches this year where she’s gone at least 20 straight innings without allowing a run, including a career-best 30.1 inning stretch from April 1-10. During the team’s current 27-game winning streak, the second longest in program history, Parker has a 1.21 ERA with 139 strikeouts in 127.1 innings and an opponents’ batting average of .188. MORE >> OU Softball news and information. Miller is an All-American for the first time in her career. The 2016 co-Big 12 Player of the Year, Miller was also named to the All-Region First Team for the second straight season. She leads the Sooners in batting average (.400), runs (52), hits (78), doubles (22), triples (3) and slugging percentage (.682). Her 22 doubles this season have tied a Big 12 record, and she ranks 12th nationally with 0.37 doubles per game. Knighten becomes the seventh freshman in school annals to be named an All-American. One of three finalists for the NFCA Freshman of the Year, Knighten was named the Big 12 Freshman of the Year and has been OU’s biggest power threat this year. She leads the team with 11 home runs and 54 runs batted in, ranks second at OU in slugging (.656) and is third on the squad in average (.388), on-base percentage (.441) and hits (62). She’s started the last 29 games at first base, but showcased her versatility by also starting games at second base, designated player, right field and left field. No. 3 Oklahoma begins play at its 10th Women’s College World Series Thursday night at 6 p.m. against Alabama on ESPN2.